Remembering Popeye’s Bumblebee (Bela Zaboly)! On January 17, 2014 Popeye the Sailor turned 85 years old. The sailor man with a passion for spinach and Olive Oyl made his debut in the Thimble Theatre comic strip created by E.C. Segar. For decades Segar’s work, including his successors Bud Sagendorf and Bobby London, have been reprinted for new generations to discover. Although reprinted in comic book format during the 1940’s and 1950’s the work of one Popeye’s greatest cartoonists has been slighted: Bela “Bill” Zaboly. I still remember my first exposure to Zaboly’s work on Thimble Theatre. It was shortly after I discovered the book, Popeye the Sailor by E.C. Segar (Nostalgia Press, 1971). This was my introduction to Segar and the original Popeye. Prior to this I was exposed to Bud Sagendorf’s daily and Sunday version. Otto Honk, September 9 1934 by Bela Zaboly. Copyright NEA, Inc. The first daily strip, illustrated by Bela Zaboly, appeared on December 4, 1939. Copyright King Features Syndicate. My initial reaction to Segar’s art was thinking how closer in style it was with the characters appearing in the Popeye the Sailor animated films by Max Fleischer. I discovered Zaboly’s work when a Sunday page was reprinted in the book Comics and Their Creators by Martin Sheridan (Hale, Cushman & Flint, 1942). Zaboly’s renditions of the cast were illustrated closer to Segar than the latest strips by Sagendorf. E.C. Segar passed away in late 1938 but the Thimble Theatre comic strip was too popular to discontinue. By this time Popeye had become a licensing bonanza and his animated cartoon series was a major success at the box office. King Features Syndicate, who distributed Thimble Theatre, signed Tom Sims to write the stories and Doc Winner as temporary artist. During the Sims/Winner era both the daily and Sunday strip went unsigned. Readers of the daily strip, published on December 4, 1939, saw a signature on the left hand side of the last panel. The ‘B’ was dressed up to look like a bumblebee next to a capital Z. With this strip Bela Zaboly became the new cartoonist for the daily Thimble Theatre comic strip. It is believed Zaboly’s first Sunday page was published on January 7, 1940. According to Famous Artists and Writers of King Features Syndicate (1949) Bela Zaboly was born in 1910 in Cleveland. He was the son of a Hungarian born cabinet maker and his wife. Bela began drawing when he was three years old. At Cleveland’s West High School he cartooned for the school’s newspaper and drew strips for The Detroit Times junior page and the lush, colored junior section of The Los Angeles Times. He met his wife, the former Irene Chandas, also of Hungarian descent, at a church benefit to which he contributed a painting. They had three children together, Alwyn, Irene and Marianne. In 1932 he was offered the job as assistant to Roy Crane who was drawing the strip, Wash Tubbs. Zaboly recalled Roy as “one of the great comic artists.” During these same years he started a feature of his own for the NEA syndicate. It was called Otto Honk and featured a blond, moon-faced young man who was not especially bright. This Sunday strip followed Otto through a series of moderately funny adventures in such roles as a college football player, private detective and movie stuntman. Zaboly retired the strip in March of 1936. He was also one of several cartoonists to draw Our Boarding House created by Gene Ahern. In 1939 King Features Syndicate selected Zaboly to draw both the daily and Sunday Thimble Theatre. By 1943 the strip was syndicated to 500 daily and 200 Sunday papers. Featured in these two 1948 daily strips, illustrated by Bela Zaboly, are Geezil, The Sea Hag, Eugene the Jeep, Toar, Oscar, Davy Jones, Alice the Goon, Demon and Lummox. Copyright King Features Syndicate. Zaboly was able to mimic E.C. 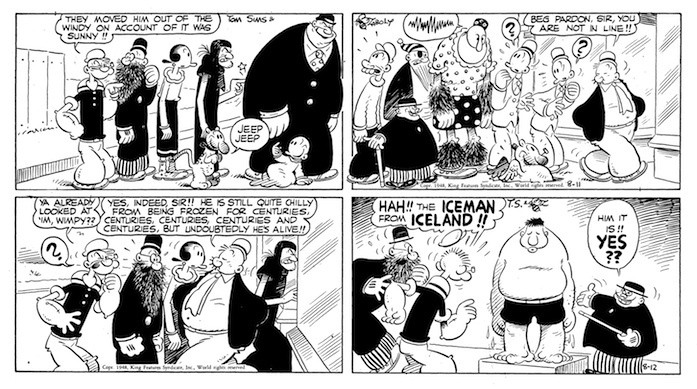 Segar’s style while Tom Sims added new characters to the strip including “Aunt Jones”, “Davy Jones”, “Lummox”, “Thee Mann” and Popeye’s long lost “Momma”. The last daily strip written by Tom Sims was published on December 4, 1954 though he continued with the Sunday page. Ralph Stein took on the writing chores beginning with the daily published on December 6, 1954. Ralph Stein's first story had Popeye encounter the first of many beautiful women. From December 6, 1954. By this time Bela was now signing his work, “Bill Zaboly.” Stein’s scripts used very little of Segar’s cast on a regular basis. Instead Popeye teamed up with tubby British explorer Sir Pomeroy Vauxhall. Segar only used Bluto in a 1932 adventure but Stein revived the bearded brute for several encounters with Popeye. Ralph Stein was also a cartoonist and his style influenced Zaboly during this period. Of note were the various women Popeye and Sir Pomeroy encountered. Many were quite attractive and this was reflected when Zaboly drew a beautiful woman in the Sunday strip written by Tom Sims. In the daily published on June 7, 1957 Popeye traveled back home to see Swee’pea. Instead of seeing the lad wearing his traditional nightgown, with his legs concealed, another version awaited Popeye. Swee’pea wore a cap and child’s sailor’s uniform with legs and feet revealed! Purists of the strip have faulted Zaboly for changing Swee’pea’s look but, in truth, he had nothing to do with it. daily strip written by Ralph Stein and illustrated by Bill Zaboly. Copyright King Features Syndicate. Philip W. Porter, the Sunday editor of the Plain Dealer, was looking over advanced comic strip proofs. The thought struck him Swee’pea had been crawling around for much too long. He wrote a letter to King Features executive, Frank Nicht, asking why he did not get Swee’pea “off the ground and out of that sack.” Consequently Stein wrote a daily strip where Popeye is introduced to the ‘new’ Swee’pea and Tom Sims did something similar in the Sunday. During Stein’s tenure Popeye, artistically, lost two out of three shirt buttons and Poopdeck Pappy, the sailor’s uncouth father, shrunk down in height. Bud Sagendorf, who was Segar’s assistant and illustrating the Popeye comic book series, had a style different from Zaboly. While Zaboly mimicked Segar’s style Sagendorf’s artwork resembled the work of his mentor. During his final days, drawing both the daily and Sunday, Zaboly began drawing in Sagendorf’s style. This decision may have been made to streamline Popeye’s appearance in all print media. However, at this time King Features Syndicate was preparing readers for Zaboly’s exit and Sagendorf’s entrance. Zaboly’s last daily appeared on August 8, 1959 while his last Sunday collaboration with Tom Sims was published on September 6, 1959. Nothing official has ever been published on Zaboly’s dismissal but I would suspect it was financial. With Bud Sagendorf producing both the daily and Sunday strip King Features Syndicate would rather pay one man than three. The last Popeye daily strip drawn by Bela (now known as Bill) Zaboly. Published on August 8, 1959. Zaboly’s Popeye art would continue to appear on various products well into the 1960’s. His Sunday pages were reprinted in King Comics, Dagwood Comics, Family Funnies and Children’s Playmate. On February 2, 1963 Editor and Publisher announced a new daily panel for newspapers called Us Boys. It would be drawn by “Bill Zaboly” and syndicated by Select Features Syndicate. The announcement stated it would be an “all-male” panel including appearances from the “male” animal kingdom. Additionally, Zaboly worked as a salesman for The Alan Junkins Studio and did freelance work. He passed away on April 11, 1985. © 2014. EntertainmentMagazine / EMOL.org. All rights reserved.